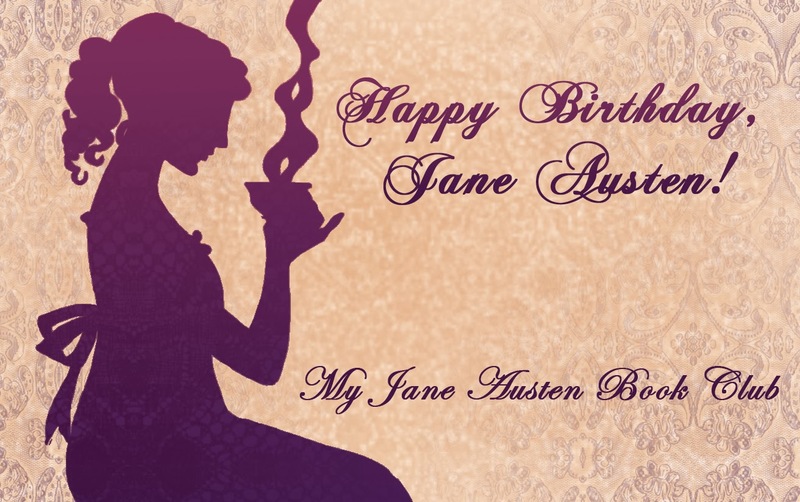 ← Stalking Jane Austen – Part One! I recently spent a busy five days in the northeast of England, ending my trip with a day in Derbyshire before flying home. My mission? To visit three different ‘Pemberleys’ in one day! With the lack of time available, these were exterior ‘gardens and grounds’ visits only, but as interiors are often located elsewhere in Austen adaptations, it seemed a fair compromise! As I was driving from Harrogate in North Yorkshire to Manchester Airport, my journey took me south and then east to west across the Peak District. 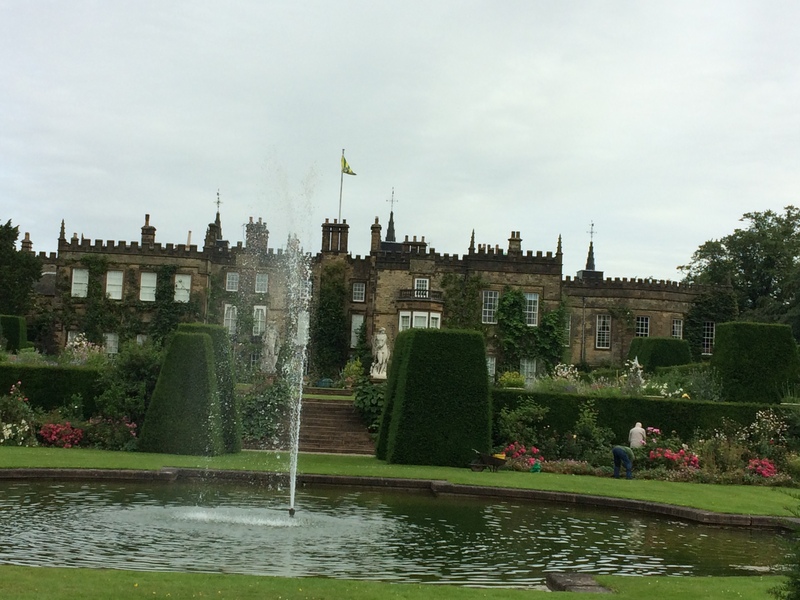 My first stop, therefore, was Renishaw Hall and Gardens at Renishaw in Derbyshire. This was a real find! The property has beautiful, classical, Italianate gardens, woodlands and a wider parkland with lakes. 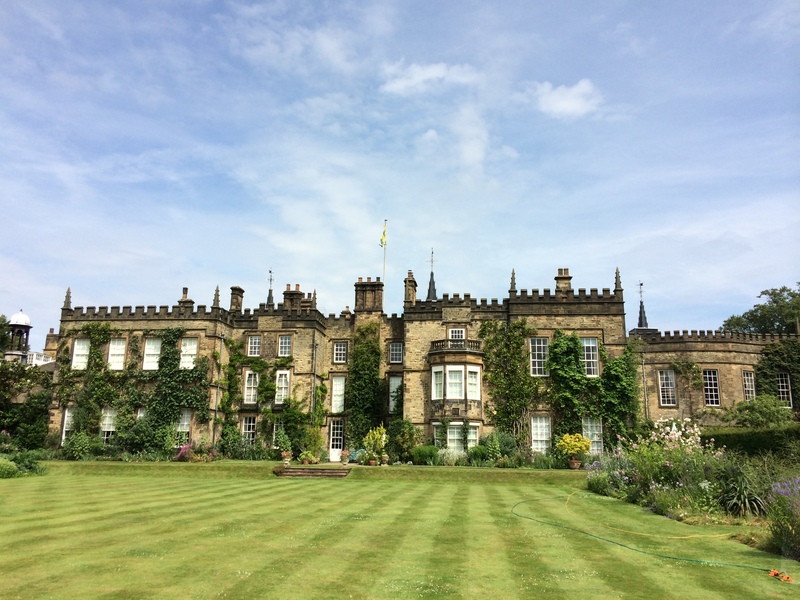 Though laid out in its present form by Sir George Sitwell at the end of the 19th century, it was used as the exterior and grounds for Pemberley in the BBC’s 1980 production of Pride & Prejudice. The lawned gardens and flower beds are a delight, bordered by clipped hedges, stone statues and laid out as though in a series of outdoor ‘rooms’, with steps between the levels, fountains, and views across extensive parkland from the boundary. However, although I followed the path to the lakes, I could not see any resemblance to the waterside location where Mr Darcy later catches up with the visitors , so I suspect it may have been filmed elsewhere. 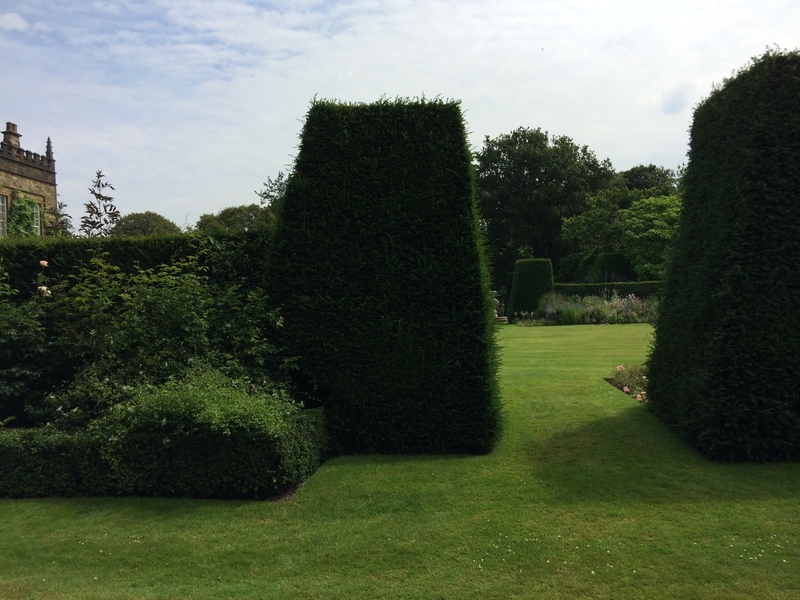 The hedge around which Mr Darcy appears! The gardens were incredibly peaceful and so beautiful in the warm sunshine. I could have lingered for hours, but alas it was not to be. As it was, I consoled myself by indulging in a cup of tea and slice of cake in the stables café before reluctantly tearing myself away, determined to revisit another day when I had more time available. Back in the car, I headed west across the Peak District to my next stop: Chatsworth! They gradually ascended for half a mile, and then found themselves at the top of a considerable eminence, where the wood ceased, and the eye was instantly caught by Pemberley House, situated on the opposite side of a valley, into which the road with some abruptness wound. It was a large, handsome, stone building, standing well on rising ground, and backed by a ridge of high woody hills; – and in front, a stream of some natural importance was swelled into greater, but without any artificial appearance… they descended the hill, crossed the bridge, and drove to the door. However, I’ve recently attended a couple of talks on houses in Jane Austen’s works, and both of these, along with some further reading, has led me to suspect it is unlikely she envisaged it as such – Mr Darcy’s £10,000 a year, according to the experts, would be insufficient to support such a vast estate as Chatsworth. Despite this, it is a wonderful place and certainly very pleasing to the eye! Exterior shots of the estate were used in the 2005 film of Pride & Prejudice, and include the Gardiners and Lizzy’s arrival to tour the property and Lizzy’s dash down the stone steps to get away from Mr Darcy when she is caught spying on his reunion with his sister. I stopped for a quick lunch (soup and yet another cup of tea!) in the Stables Restaurant and left Chatsworth with a sigh of contentment. It never fails to cheer me, and I look forward to returning whenever the next opportunity presents itself. My final destination before heading for Manchester airport was Lyme Park, known to all Colin Firth’s Darcy fans as Pemberley in the popular 1995 television series of Pride & Prejudice. The gardens date back to 1570, but the original heather moorland was only developed and tamed after the Legh family came to Lyme in 1643, one of the first creations being the avenue of Lime trees. Gravelled walks followed, along with bowling greens and tennis courts, hot beds and greenhouses. 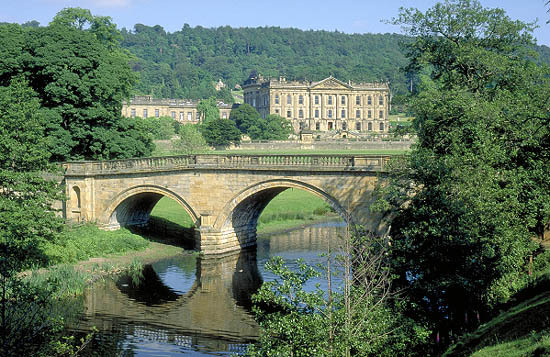 In 1687, a canal and fountain were added, allegedly influenced by enhancements on the Chatsworth estate. There then seemed a lull in the gardens’ development until 1813, at which time they were remodelled and the orangery begun. An Italian garden was developed in 1860, but this later became the Dutch garden due to the planting of many beds of tulips. The rose garden and herbaceous borders were not added until the early 20th century. 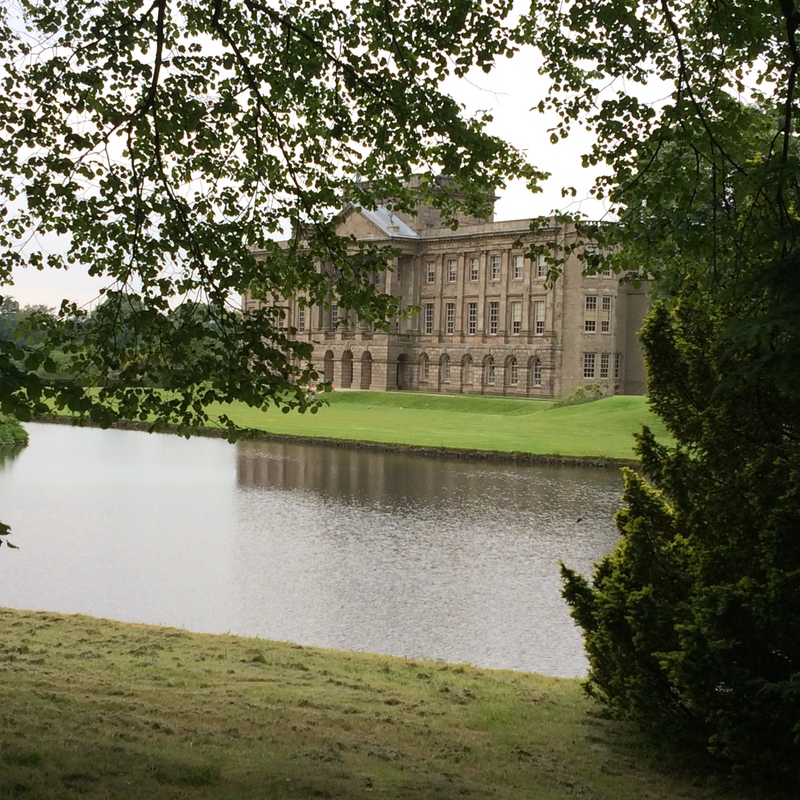 The only downside to Lyme Park being depicted as Pemberley is in its location! It isn’t in Derbyshire, but in the neighbouring county of Cheshire! I had no time for indulgence in tea here, sadly, but enjoyed a brisk walk around the gardens and grounds, the adaptation clear in my mind as I walked. Amusingly, the map of the grounds has ‘Darcy’s Lake’ marked for those who are prepared to walk to see it – I didn’t have time on this visit but will make sure I go there next time! All in all, it was a very Pemberley sort of day! Renishaw Hall Guided tours of the house available on selected dates; gardens and grounds open seasonally 5 days a week. 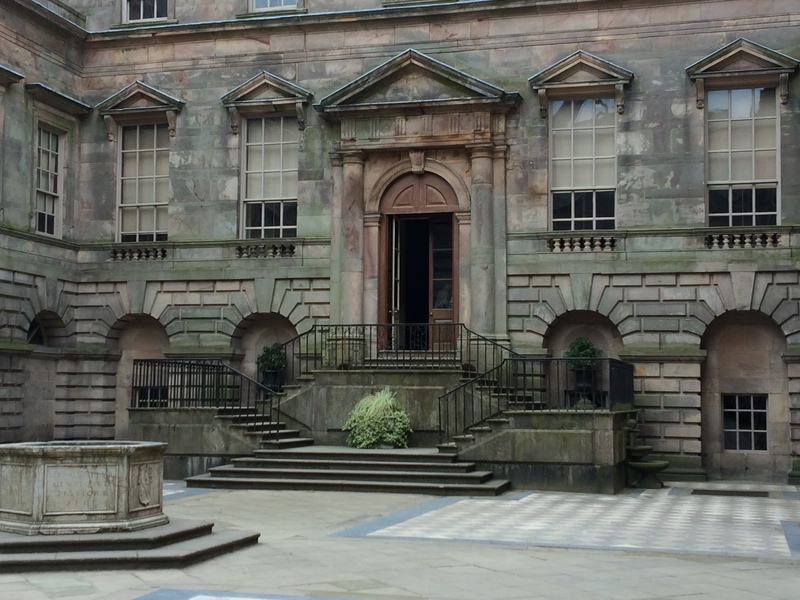 Lyme Park – House open Feb-Oct 5 days a week; Garden open Feb-Oct 7 days a week; Park – open all year. All photos are my own other than the really good one of Chatsworth from beyond the bridge, which belongs to http://www.timetravel-britain.com! 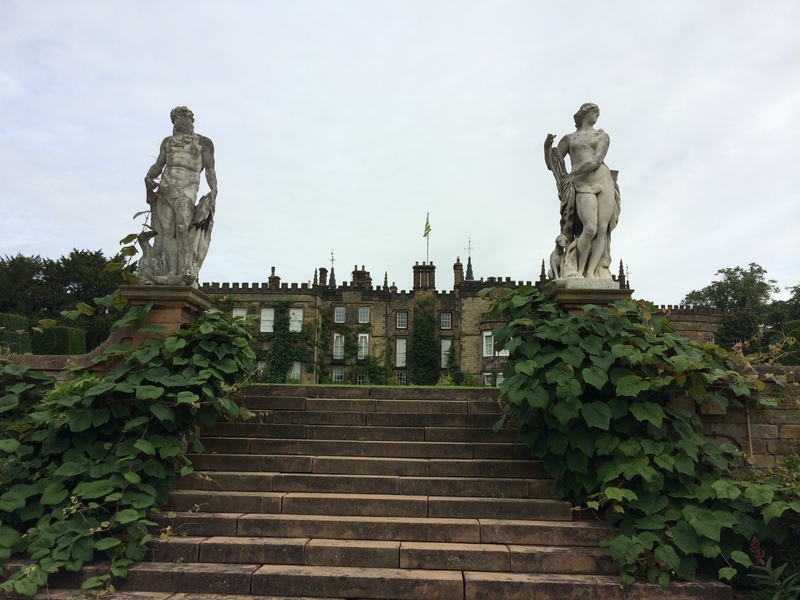 This entry was posted in Uncategorized and tagged Chatsworth, Derbyshire, Jane Austen, Lyme Park, Pemberley, Pride & Prejudice, Renishaw Hall. Bookmark the permalink. 26 Responses to Three Shades of Pemberley! Sounds like you had a lovely day! The only one of them I’ve actually been to is Lyme Park, many years ago, pre 1995, when some friends used to live in Cheshire. Somewhere, in a box, goodness knows where, we have actual photos (and negatives, I expect) of our visit. We couldn’t go inside as it was closed for some reason that I can’t remember, but we had a great time wandering the grounds on what I recall was a very hot day. Chatsworth is a place I keep saying we must visit one day, but like Highclere and Chawton, it’s on my stately home etc equivalent to a TBR list – guess we’d call it a TBV list. 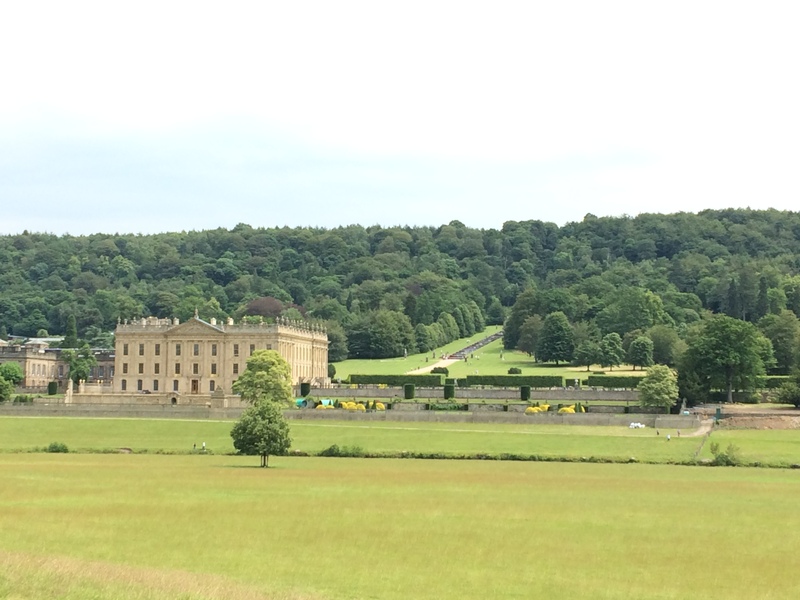 From my interpretation of Pemberley, I’d always imagined it to be reasonably grand but not “Chatsworth grand”, so Renishaw or Lyme Park might be more on the right lines. Thanks for the very interesting post and lovely photos. Renishaw Hall was a real find, Anji! I loved the gardens so much, and I was really sorry I didn’t have time to stay for the guided house tour. Chatsworth is so easy to get to from where you live! We used to go regularly! If you haven’t done it next time I am in Yorkshire, let’s go together! So pleased you enjoyed the photos and post. Yes, I know Chatsworth isn’t too far away, just finding the time to do it! A trip there sounds like a great idea. Thank you for the tour. Did I miss reading which was your favorite? What lovely, stately homes. For me it would be a nice place to visit but I sure wouldn’t want to live there. You? I would love to visit Lyme Park and also Harewood House. What a treat it would be to see them all! I was really impressed with Renishaw, Vee! I had never been there and the gardens were so pretty! I took so many photos but there just isn’t room for them. Perhaps I should add an album to Facebook with them all in. 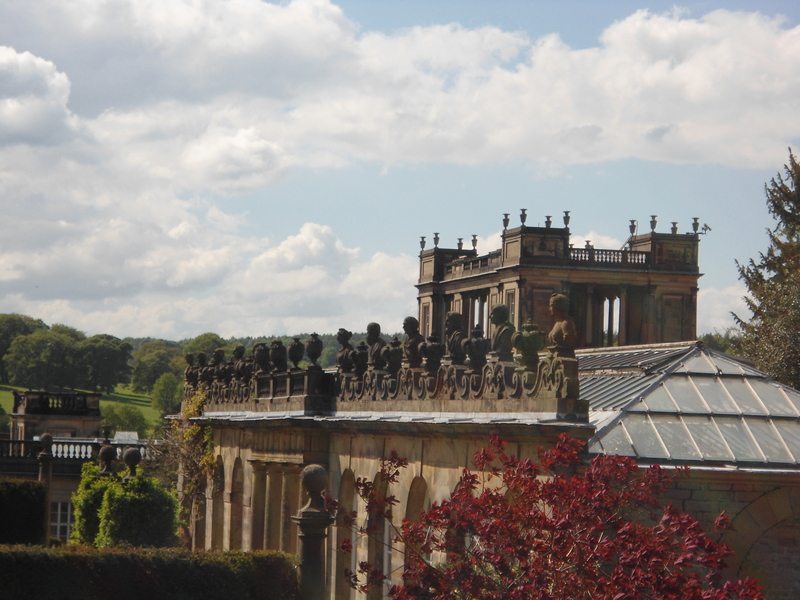 I do love Chatsworth too – I am very fond of it! I have been in the grounds at Harewood – the terrace is gorgeous – but never been in the house yet. Thanks so much for sharing the pictures. Too bad your time was limited. Beautiful! I loved all your pictures, Cassandra. The ‘Pemberleys’ are beautiful estates. I have visited two of them and did enjoy seeing the inside of Chatsworth too. 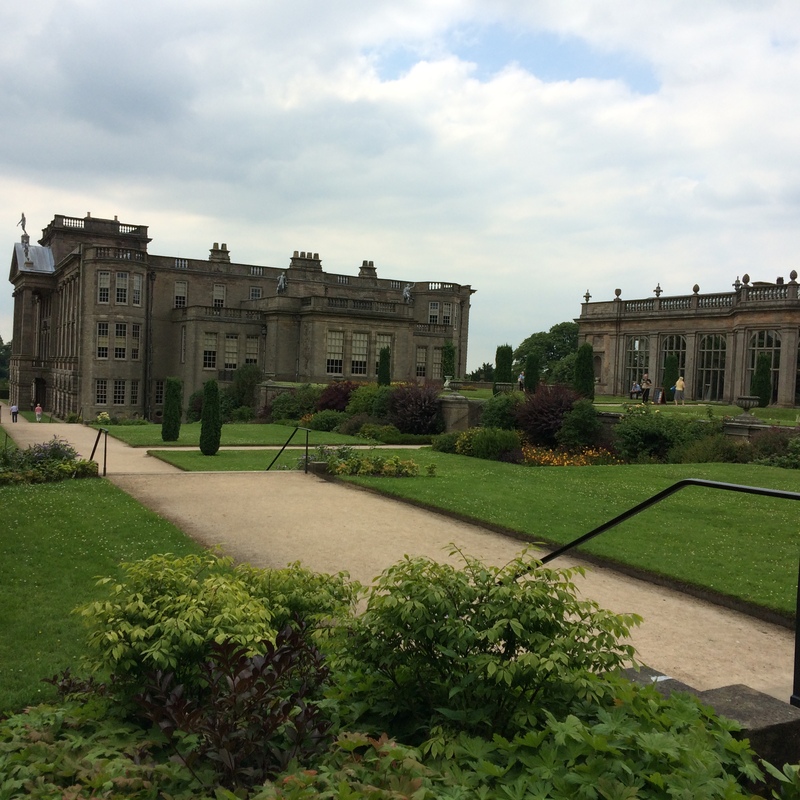 I chose not to go inside Lyme Park since it was not used for the interior but also because of the grounds. I could have spent the day touring the gardens and walking. It was such a gorgeous place. I did walk to the lake and it started to rain on the way. It is quite a lengthy walk and with the rain, it was chilly. I was glad to have my coat. I got several pictures and that was fun. I would love to see Renishaw. It looks fabulous. I can’t imagine living in one of those estates much less running it. Amazing to think about and read about though. Thank you for sharing your tour with us. I enjoyed reading it and looking at your pictures. I definitely want to do the walk to the lake one day! The grounds are lovely, aren’t they? Renishaw was such a surprise and so beautiful. Next time, I will do the guided house tour as well! Thank you for reading and commenting! Will catch up with you on email! I have only been to Lyme Hall and Chatsworth. 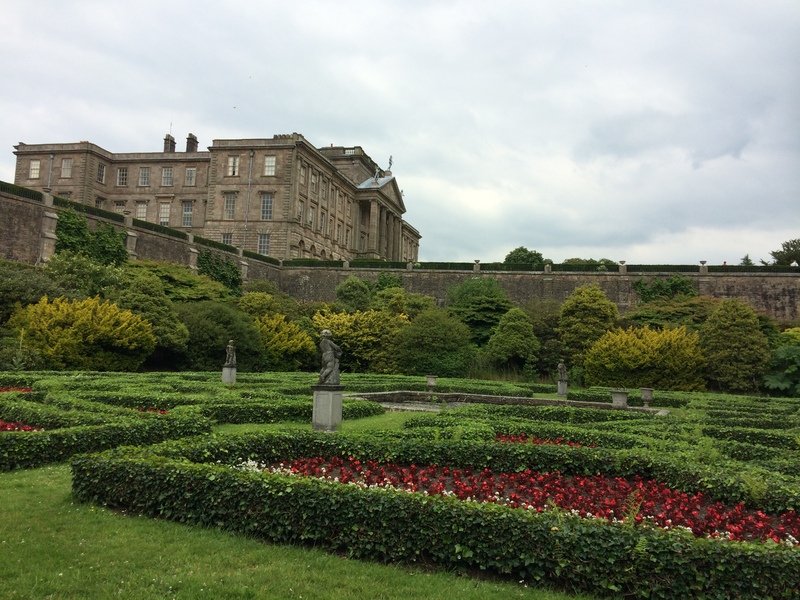 Both are very elegant but I like Lyme Hall the best since it was used in my favourite version of P&P. I will have to add the other to my list of places I visit for the next time I am in England. Thank you for sharing these pictures! I do hope you get to visit Renishaw! My photos don’t do the gardens and grounds justice! I will definitely put together an album to put up on Facebook because it’s a shame not to share them. Believe it or not, I’ve never been inside Harewood House either, but we’ve been in the grounds lots of times. A friend and I, years ago, went to see an open-air production of P&P there. It wasn’t one of the sort of productions where audience and actors move around to different locations for each scene, but it was on a stage on the lawn in front of the main house. I guess you can call that another Pemberley link. Absolutely! I have never been in the house either, despite just spending 7 years living not too far away! We have been to the grounds a lot but never managed to catch a play there sadly. Oh, so lovely. We here in America don’t have the estates with their history you do and I love to tour historical settings. I do have a large “coffee table” book with photos and histories of many British Estates, but my son “borrowed” it. Now I must get it back and re-read about those mentioned here. I keep a binder about the places used in the various movies. Thank you for this tour vicariously through/with you. Pleased you enjoyed the tour – wish I could have shared more images but there wasn’t room! Not only do I need to visit Bath but all of these lovely ‘Pemberley estates’! I think one needs at least two days visiting each one. One for the grounds and one for the interiors! Mind you, I do love gardens and a good ramble that it may require three days each in total! Thank you so much for sharing and I love the photos! I agree, Carole – at least two days, and three if you can manage it! There is also of course all the homes used as the interiors, so there must be several more Pemberleys to visit after these three! The gardens at Renishaw were just gorgeous! Oh I am sure you will love Renishaw’s gardens, Tamara! Allow plenty of time so you can enjoy! I recommend getting there on a week day at opening time if possible (they are open Weds-Sun I think) as it was so quiet and peaceful with very few visitors! I love Chatsworth too, even though it’s not the perfect Pemberley. We used to go there a lot when we lived in North Yorkshire; it was a favourite day trip and we particularly used to love going there for one of the Christmas evenings. Perhaps we’ll all manage to meet at one of these lovely places at the same time one year! Can’t believe I’ve only just seen you commented, Joana! I’m glad Hazel commented recently so I found it! Great post and lovely photos. Had you managed to get to Darcy’sLake at Lyme I think you would have been quite shocked at how disgusting it is! My other half flatly refused to recreate the moment! LOL Hazel! I didn’t miss much then? I am pretty certain my other half would flatly refuse too if it was that unpleasant!